Freedom is the notion everybody strives to achieve. This time Freedom Driver liberats the ears of music lovers. 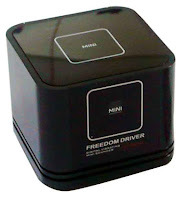 Tthe Freedom Driver turns virtually any flat service into an advanced quality audio speaker system in an instant. The only thing you should do is to place the unit on any flat surface such as wood, glass, marble or stone and is transformed into a high quality speaker system. There are three models of Freedom Driver – B20, B22 and B25. The B22 plays music directly from USB Flash Drives, SD Memory sticks or any source using a standard audio line. The B25 - wireless using Bluetooth technology to interact with any Bluetooth enabled systems. The sleek design maintains a high density.